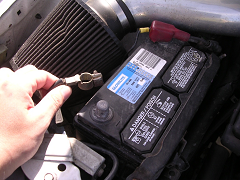 To start, inspect your part to make sure a car battery replacement is needed. Sometimes what happens is sulfate builds on the unit and this white substance can prevent the battery from recharging. If you notice some on the part, take a combination of baking soda and water and put it on the sulfate deposits to remove them. Next, you will want to try starting your car. If it doesn’t start then you’ll need to do the car battery replacement. First, you’ll want to stop by a local auto parts store to pick out the correct type. They may have resources there like a car battery size chart to help you in the selection process. In most cases, you can go up to the counter and they can give you choices after searching in their computers by your vehicle’s make and model. As there are many different options available ranging from cheap car batteries to electric car batteries, ask the person helping you what brands they recommend. While car battery cost should be a key factor, spending a little bit more to receive a top brand like Kirkland could be well worth the money due to the excellent performance and warranty they offer. Next, you’ll want to have the correct tools on hand to do the job. Items like an adjustable wrench, adjustable pliers, safety goggles, a hammer and gloves can help you do the job well and safely. When you remove your old battery, make sure to clean off any remaining sulfate. Also, you will want to inspect it for cracks. From here you want to loosen the bolt that keeps in place the cable running to the negative post. You can take off the bolt by moving a wrench in a counterclockwise direction. Once the bolt is loose, remove the cable. Next, repeat these steps to remove the positive cable. After this you may notice a plate that holds the battery in place. If you have one remove it then carefully lift out the battery, making sure to watch for cracks where acid can seep out. Now that you have the old unit removed, check the cables to see if there is any corrosion. If so, replace the cables. Now you want to take the new battery and put it into its proper position in the car. Next you’ll want to begin the reattachment process by first hooking up the positive then the negative terminal. Once everything is securely in place start your car to make sure it’s working properly and if it is you have done a successful car battery replacement.